" Thank you for helping me with FILESONIC. It was a pleasure doing business with you and I am sure that I shall be contacting you again in the future whenever any need arrises from my end. Your prompt service is truly appreciated. " Welcome to 365Premium.com, we are authorized / official reseller & distributors for Filehosting in India and we sell only legal vouchers. 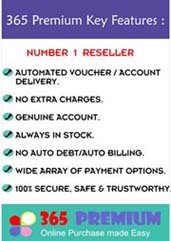 We are the world's only automated resellers for Premium account / voucher . We offer Instant Delivery of Premium accounts (24/7, 365 Days), wide range of payment options (Credit Cards: Visa MasterCard Diners Club, Debit Cards: 52 Banks, Net Banking: 10 Banks, Cash Cards, Cash Deposit, NEFT & More) fantastic prices, excellent customer service and the widest range of Premium accounts. If you require any help, please consult our customer care. © 2015 365Premium.com All Rights Reserved.